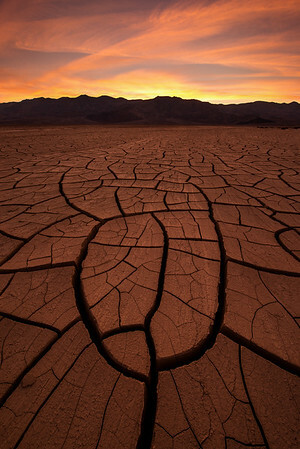 Death Valley National Park is one of those places that is filled with dichotomies. It has both the lowest point (Badwater) and the tallest point (Mt. Whitney) in the United States; it has salt flats next to sand dunes; and oasis next to desert. It’s also both absolutely gorgeous yet incredibly difficult to photograph. I’ve been to Death Valley on a number of occasions but never really come home with photographs that I was happy with ... until November of 2016 when I returned with one of the most successful photo trips I’ve been on. Willie and I flew to Las Vegas where we met up with David Thompson and then eventually made our way to Death Valley. We knew there were several playas filled with beautiful mud cracks and made our way to this particular patch. It was a photographers heaven, with beautiful compositions of foregrounds everywhere we looked! When I saw this particular mud-crack I immediately thought “this look like a peace symbol!” We still had an hour or so before sunset, so I dropped my hat at the spot to mark it for later, and kept exploring. Just before sunset, we noticed clouds had settled over the peaks behind us and were set to light up for sunset! I raced back to the peace symbol just as the clouds lit up with beautiful oranges and yellows!